Now it's up to you to help Buffy and her friends stop the spread of Evil in Sunnydale! Which villain and his minions will plague the town? The Master? The Judge? The Mayor? Or Adam? Each game recreates one of Buffy's four most exciting challenges... use your own strength and skill to outwit them all! Patrol the board. Collect cards and gain power. Roll dice to fight and cast spells. Finally, rid Sunnydale of Evil to win! But don't slack... or Evil will slay you first! Comes with gameboard, pewter Buffy icon, Phases Chart centerpiece, 5 Good Player & 13 Evil Player pawns and stands, 84 Evil, Weapon, Research, Help & Artifact cards, 4 Villain tiles, 4 Good Player cardholders, 1 Evil card stand, 10 dice, 10 life counters. 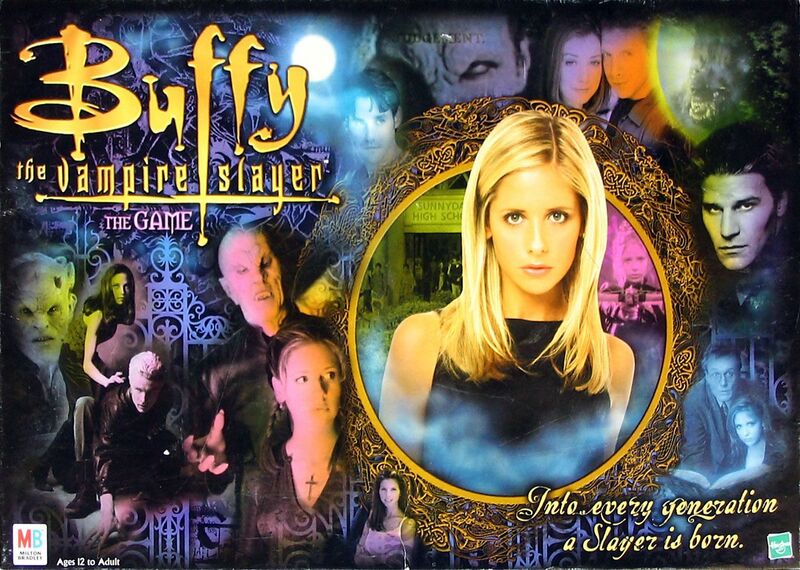 Same theme and nearly identical name, but a different game from Buffy the Vampire Slayer: The Board Game.